The Pantanal (swamp or marsh in Portuguese) is a region in South America lying mostly in Western Brazil but extending into Bolivia as well. It is considered one of the world's largest and most diverse freshwater wetland ecosystems. 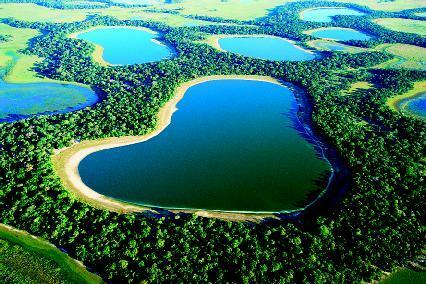 The Pantanal is also one of Brazil's major tourist draws, for its wildlife. Some of the large cattle farms offer accommodations and organized tours. Millions of waterfowl breed along the Pantanal National Park rivers and lagoons of. Dense populations of jaguars, capybara, hyacinth macaws, roseatte spoonbills, jabiru storks, kingfishers, rheas, magnificent Tababeuia trees and others thrive in its forest and grasslands. The Pantanal attracts dense populations of animals that feed and breed along its waterways, including giant river otters, river dophins, marsh deer and tapirs. The wetland also provides habitat for more than 650 bird species, including cormorants, egrets, herons, ibis, jabiru storks and roseate spoonbills. 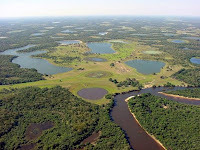 Less than 2 per cent of the Pantanal is under federal protection. 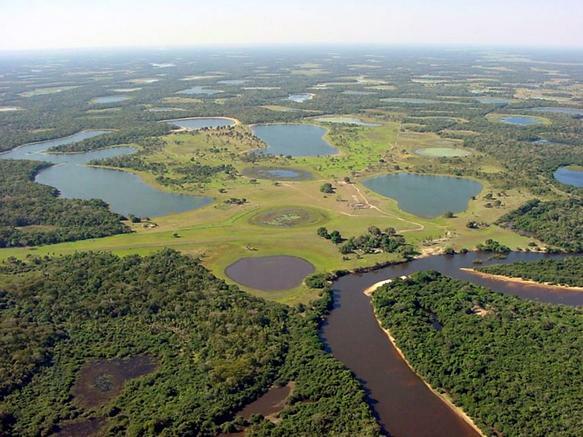 The strategic location of Pantanal makes it more vulnerable to the advance of large scale agriculture, cattle ranching, water pollution, dams and transport navigation, thereby increasing the pressure on the local habitats. Funds go directly to manage, monitor and restore this vast 400,000-acre watershed, critical habitat for migrating animals during the rainy season. CLIMATE: Usually warm to very hot and dry throughout, but occasionally winter cold fronts push up from the south bringing cooler weather and some rain. DIFFICULTY: Mostly easy and flat. There is one steeper and more difficult optional hike at Cristalino.